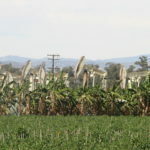 A recent Letter to the Editor by Kimberly Rivers (executive director of CFROG) in the VC Star claimed that drilling new wells in existing local oil fields equates to Ventura County being “Locked in an Energy Past.” However, statistics from the California Energy Commission (CEC) on oil and gas consumption versus production tell a different story. In California, gasoline consumption continues to rise while production of crude oil declines. To make up the difference, over 54% of our crude oil supply currently comes from foreign countries via oil tankers across the world’s oceans. Further, the Sacramento Bee article quotes Governor Jerry Brown’s executive order that set a lofty goal of 1.5 million electrics and plug-in hybrids on the road in California by 2025. According to Kasler: “Figures from the air board and car dealers association show that Californians already own 250,000 electric vehicles and plug-in hybrids.” This compares to nearly 30 million on-road vehicles currently registered in California. So, electrics and plug-ins are less than 1% of registered on-road vehicles today, and even if the Governor’s goal was achieved in the next 8 years, they would make up only 5%. 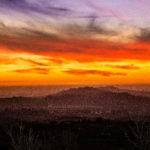 To decide that oil production in Ventura County is an “energy past” we would need to characterize the “energy present.” While there is much optimism that our energy future will include more renewables and less fossil fuels, we need have a better understanding of where and how our current energy is produced. 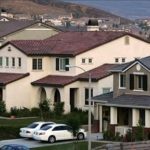 A reliable source for such statistics are the California Energy Commission (CEC) and the California Division of Oil, Gas and Geothermal Resources (DOGGR) websites. A short video from the CEC website shows: “How Oil Gets From Below the Ground to Your Car” in California. As there is much discussion about global climate change in energy conversations these days, we decided to analyze transportation fuels first as emissions are a major contributor to greenhouse gasses. Because oil is the feedstock for a majority of California’s transportation fuels, our research this month focuses on where the oil comes from, how much is produced, and how much we consume to keep up our present lifestyles. Next month we will research California’s production and consumption of natural gas, renewable energy and the other primary sources for heating, cooking and electric power generation. An important question will be how California will meet the demand for electricity considering the goal of 1.5 million electric and plug-in hybrid vehicles by 2025. 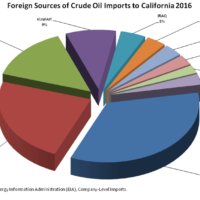 In our research, we found that there are no pipelines coming from other states or countries to supply crude oil to the state of California. 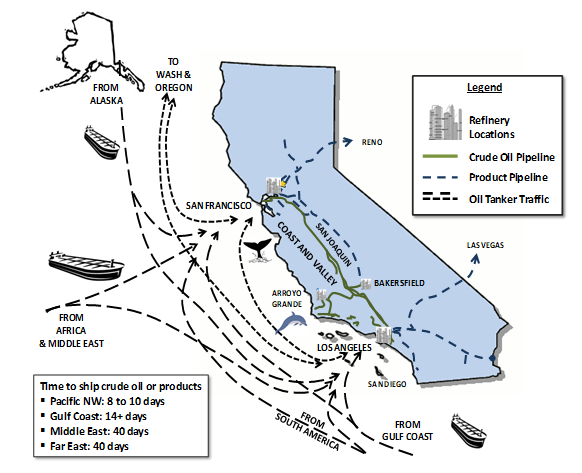 In fact, 99.5% of oil we refine is either produced in California or is brought by tankers across the oceans. 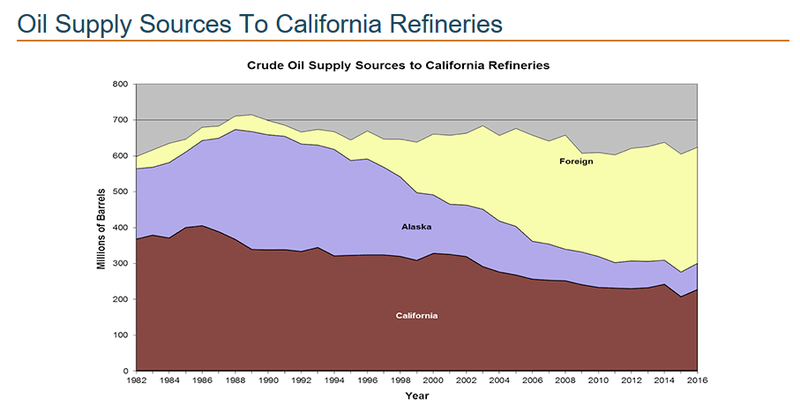 And California crude oil production has been declining since the mid-1980s. 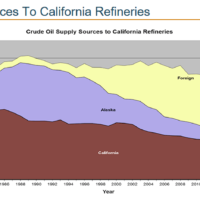 The CEC counts twenty refineries in California. Half of every barrel of crude oil is refined into gasoline and diesel fuels which is then blended with 10% ethanol to supply our vehicles. Gasoline and diesel sales in 2015 were reported at a staggering 19.3 billion gallons. And California gasoline sales have been on the increase, despite mileage standards, since 2013. The other half of the crude oil stock is refined into products including jet fuel, kerosene, heating fuels, industrial fuel oil, asphalts, waxes and lubricating oils. And the refined products are manufactured into plastics, cosmetics, pharmaceuticals, adhesives, detergents, solvents, fabrics, and more. To see the surge of products refined from petroleum that we rely on for our standard of living, just visit a local hospital. The standard of care relies on plastics and many other petroleum based materials. More astounding is the number of countries that supply the crude oil for our present lifestyle. Per another chart from the CEC website (see below), Saudi Arabia supplied 34% of foreign oil imports in 2016, totaling 108 million barrels. In fact, the top nine exporters include Colombia, Ecuador, Kuwait, Iraq, Oman and Angola. Recently, local environmental activists, have been waving the banner of global climate change while opposing Ventura County oil and gas projects in existing oil fields. These groups are advocating against local oil production in the face of hundreds of millions of barrels of oil being transported across our oceans, every year, from Alaska, Middle Eastern and South American countries. 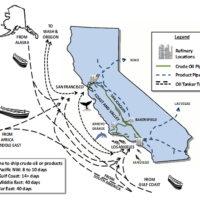 To illustrate the magnitude of California’s oil import stream, Western States Petroleum Association (WSPA), prepared the graphic below showing transportation routes, California ports of entry, and refinery locations of foreign imports into California. The time it takes to ship oil from Middle-Eastern countries to these ports via oil tankers is 40 days. According to DOGGR, in 2016, California produced a total of 188 million barrels of oil, a 55 million barrel decrease in production since 2005. And this is while the demand for transportation fuel has increased. 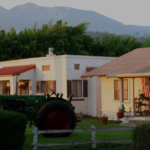 Locally, Ventura County onshore oil production has been declining since the late 1970s from the peak of nearly 18 million barrels annually to a low of 6.9 million barrels in 2005 (DOGGR and Drilling Edge). 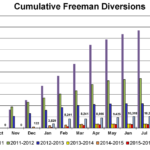 In 2014 annual production reached another peak of 8.7 million barrels, declining to 7.5 million by 2016. 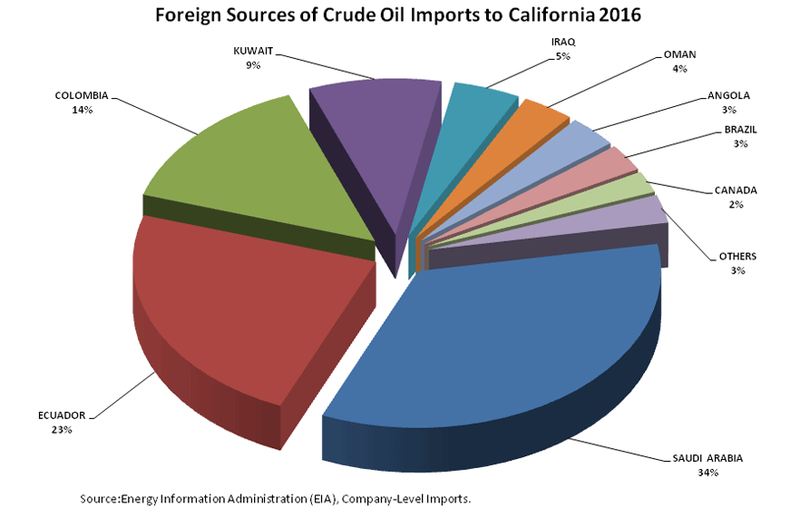 Increases in Ventura County oil production directly replace foreign imports. The production increases from the low in 2005 reflect local drilling projects that reflect industry advancement, investment in technology and compliance with the stringent requirements of the California Environmental Quality Act. From the perspective of global climate change, CoLAB believes that it is critical for Ventura County to continue to produce local oil to keep up with demand and reduce our dependence on foreign oil. Every single barrel of oil not produced in Ventura County causes more tanker traffic across our oceans, contributing greenhouse gasses and reducing our energy security. 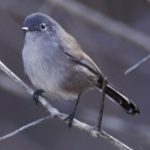 To describe our reliance on oil in California as an “energy past” is a denial of our “energy present.” Environmental advocacy should be focused on ways to reduce the demand for gasoline rather than opposing local oil production projects with groundless appeals. 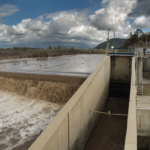 We urge Ventura County agencies and decision makers to make planning level decisions based on facts.